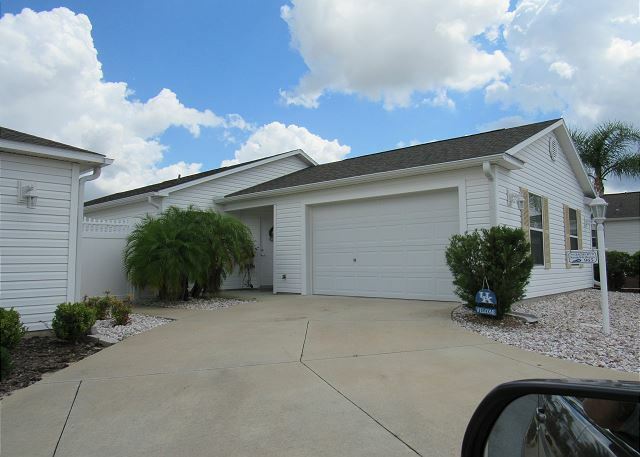 The Villages, Florida United States - GOLF CART 2 BEDROOM COURTYARD VILLA THE VILLAGES FL 1 HR FROM ORLANDO | RE/MAX PREMIER REALTY Inc. This short term two bedroom two bath courtyard villa is located in the village of Bonita in the Pilar Villas. Completely furnished and ready for a seasonal tenant to move in! Split bedroom plan. Kitchen opens up to the dining and living area. There is an area in the kitchen for dining. There is also dining for four to six guests in dining room. Villa has a nice screened lanai on the back of the house with a good view! Low maintenance landscaping. Completely private home. One car garage with a golf cart for your use. Pull out sofa in the den. Washer and dryer in the garage. Great location and close to dining, shopping and golf. This is a non smoking and no pet home. Bring your clubs and come have some fun. Wifi and Cable included. A guest from Fort Recovery, OH United States recommends this vacation rental. We enjoyed our stay. The location was just what we were looking for. The house was clean and homey. We would be interested in booking this home again this January and February, 2020. Is it available? How much? Kim B. from Virginia Beach, VA United States recommends this vacation rental. Great location. Immaculate and quiet. So happy you enjoyed your stay! Look forward to seeing you again! A great place, & Dena the manager was great! A guest from Clarkston, mi United States recommends this vacation rental. Dena the rental manager was very helpful and only a text or phone call away. The home was a sweet two bedroom beachy theme, with a well-equipped kitchen. It was a little bit of a walk but we enjoyed walking to Sumter Landing for coffee in the a.m. The mail station was just a short walk away. The neighbors were quiet, helpful & inclusive, even though we were only renting. The owners kindly gifted us a daily newspaper for our enjoyment. Thanks From J&S B. Thank you for the feed back. We are glad you enjoyed your stay and hope to see you next season!